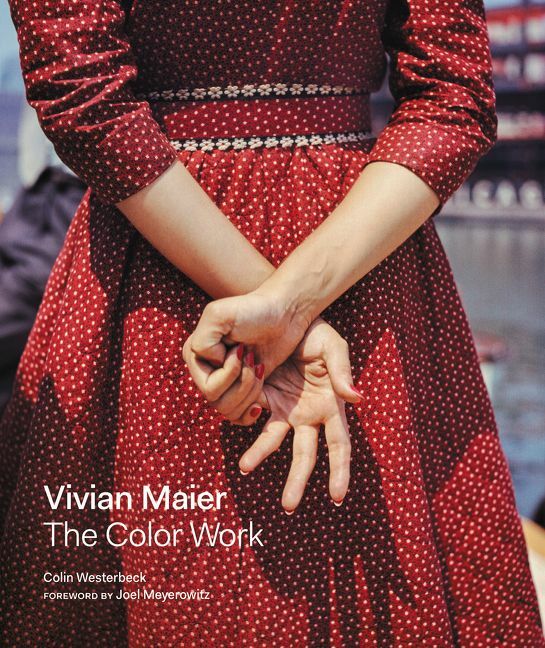 Vivian Maier: The Color Work is the first definitive monograph of color photographs by American photographer Vivian Maier. With a preface by master of color photography Joel Meyerowitz and text by photography authority Colin Westerbeck, the book features approximately 150 full color images, almost all of which have never been published. The Howard Greenberg Gallery in New York represents the work of Vivian Maier and will host an exhibition upon the books publication as well as coordinate exhibits on a global level. Though it has been ten years since the discovery of Vivian Maier’s remarkable work, most details of her life continue to remain a mystery and so her allure remains. Her storythe secretive nanny-photographer who became a popular sensation and joined the ranks of top midcentury street photographers like Garry Winogrand, Lee Friedlander, and Diane Arbus shortly after her deathhas, to date, been pieced together only from previously seen or known images she made and the handful of facts that have surfaced about her life. She made over 150,000 images in her lifetime, chose to show them to no one and, as fate would have it, succeeded brilliantly in fulfilling what remains so many peoples secret or unrealized desire: to live in and see the world creatively. Maier was a pioneer picture-maker who was a role model for street photography. Vivian Maier: The Color Work is a curated collection of Maier’s color work, most of which was found in Kodak Ektachrome slides. Much of her color work from the 1970s until her death was more abstract than the black and white images she normally captured that featured the children she cared for or people on the street. Her color work focused more on objects, such as newspapers or stills of everyday occurrences on the streets. Colin Westerbeck, a former curator of photography at the Chicago Institute of Art, and the Howard Greenberg Gallery, which represents Maier, have culled approximately 150 images from her archives and have had them reproduced at high-resolution especially for this book. A foreword by Joel Meyerowitz, a world-renowned master of color photography, and text by Westerbeck sheds light on the nature of Maier’s color images, comparing it to her black-and-white ones as well as the work of her peers. It provides a deeper understanding of this intriguing photographer and emphasizes how keen she was to record and present her interpretation of the world around her through her pictures. These images come from the collection of John Maloof, who discovered Maier’s images, owns the majority of them (some 100,000 negatives that he bought at auction), and works in conjunction with Maier’s estate. The Howard Greenberg Gallery, which shows the images in Maloof’s collection, is participating in the creation and marketing of this book and is constantly coordinating exhibitions worldwide.